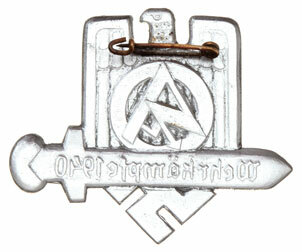 SA Wehrkampfe 1940: This is one of the few SA wartime badges you can find. It does not list a city because it was struck for SA men from any German city. 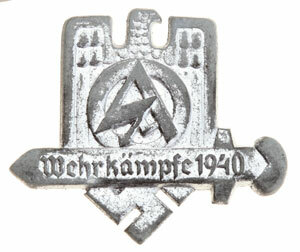 WehrKampf badges were weapons training camps to qualify men destined for induction into the Wehrmacht. Feinzink with silver brennlack finish, soldered brass pin, scarce, moderate wear.